This is snother WordPress blog with a custom designed theme I built. 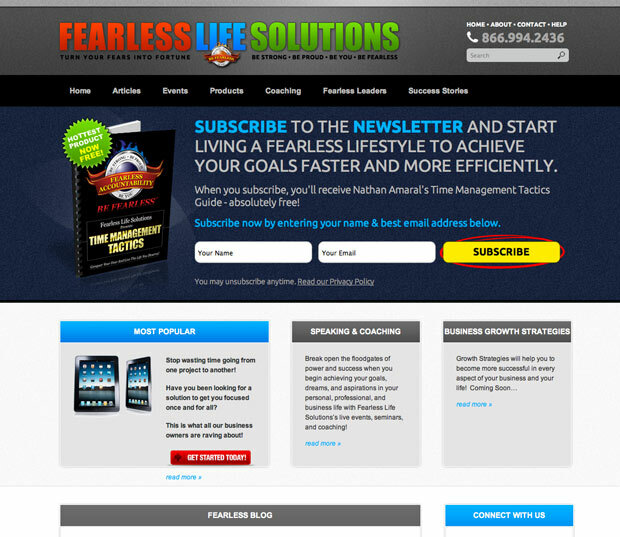 The client supplied me with a couple of example sites, that show the styles he likes and we worked through it until we achieved the look he liked. You will see the navigation bar has drop-down sub menus which are populated by the WordPress’s custom menus feature. This feature really makes WordPress so much more powerful. The ease of controlling what is displayed in the navigation bar has come a long way from just displaying the pages. The homepage modules are hooked up to the posts in the blog and get called into each box by category id. So every time a new post is published in the specific category, the box will update with the latest content. We also went ahead and added the ShareThis plugin that let us put the nice looking social buttons with counters into each post. The new ShareThis makes it really easy to do. I remember a while ago trying to use their plugin and it was not very good and not much control yet, but now, I use it a lot.